Afghanistan presents a complex migration context in which large numbers of Afghans set out on dangerous journeys to Europe. While there is a significant body of migration research in Afghanistan, existing research tends to focus on high-level, structural drivers of migration. Little is known about how migration decision-making evolves over time for those who intend on leaving. To address this key knowledge gap, Seefar launched the first longitudinal study of Afghans intending to migrate irregularly to Europe. The first report in the series shed light on migration motivations, planning processes and influences for a small group of Afghans planning to depart for Europe in the next 12 months. 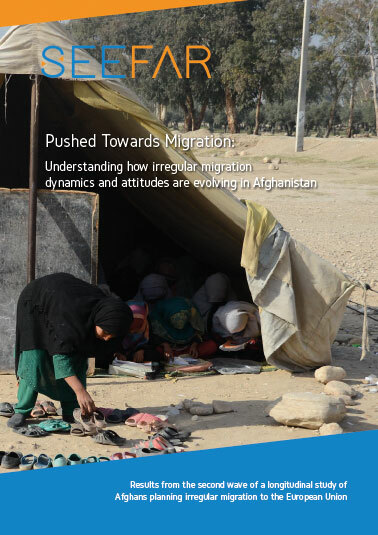 Pushed Towards Migration: Understanding how irregular migration dynamics and attitudes are evolving in Afghanistan is the second installation in this longitudinal study. This second report has a larger sample size (210) and geographic scope (14 provinces) than the first. Most appear unrealistic about migration timelines. But long-term economic improvement would discourage migration. Family and friends at home were influential in the decision to leave Afghanistan, while personal networks abroad influenced how plans took shape. Migrants preferred Germany and largely held positive views of life abroad.